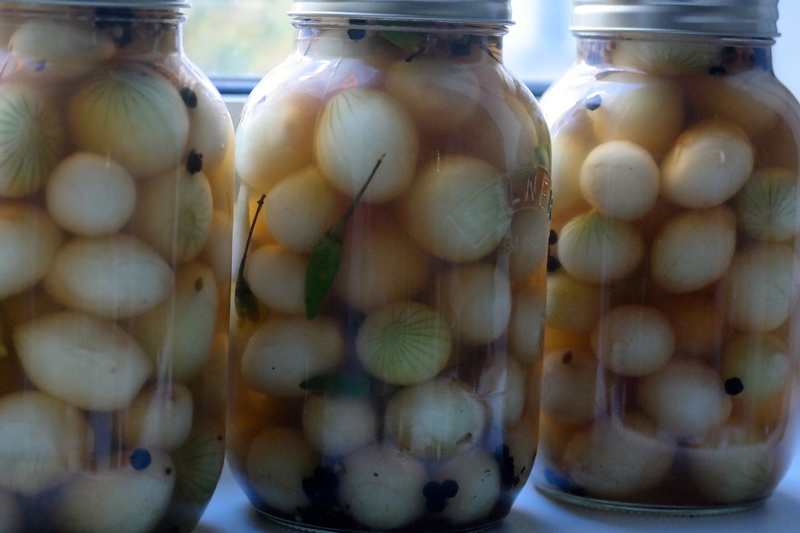 Pickled onions just say Christmas to me. It is the only time of the year that I eat them. I have not made my own for about 25 years but, this year, I had some kilner jars in the cupboard, from my failed experiment with salad in a jar, back in the summer, so I thought I would put them to good use. It is not easy to find pickling onions in Berlin and shallots are pretty expensive to buy in bulk. I was lucky to find small onions in Aldi last week for 99 cents per half kilo bag. You can experiment with the vinegar you use. I used cheap white wine vinegar but you can use malt vinegar if you want a stronger flavour or even raspberry or balsamic. These latter options are more costly. To make the onions easier to peel, cover them in boiling water and then pour off and cover with cold water. The skins come off more easily but it is still a labour of love. I sat at the kitchen table on Friday night watching Grand Designs on the Macbook and was quite content. Quantities are not exact as the size of onions varies as do jars. Peel the onions and place them in a large washing up bowl. Cover with cold water and add the salt. Stir to dissolve salt. Cover with a large, saucepan lid and weigh down with 4 large tins. Leave to soak overnight. The next morning rinse the onions well and pat dry. Combine the vinegar, sugar and spices in a stainless steel or enamelled saucepan and bring to the boil, dissolving the sugar. Turn off the heat and leave to completely cool. Sterilise the jars either with a sterilising tablet or wash in hot, soapy water, rinse well and place in a hot oven for 5 minutes to dry. 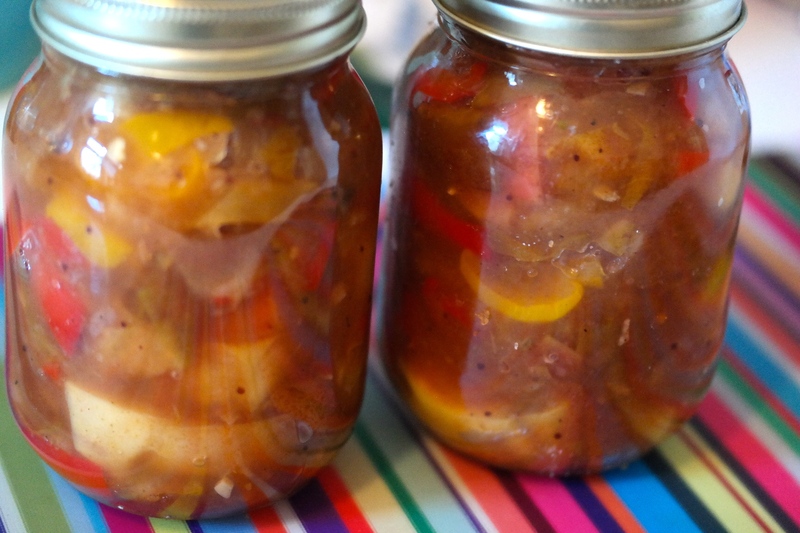 Let the jars cool and pack tightly with the onions, adding the chillies as you go. Pour on the cooled vinegar. You can either remove or keep the spices in the vinegar, as you wish. Seal the jars and store for 6 weeks before eating. Thoughts are turning towards Christmas. When I was a teenager we started making our Christmas pickles and chutneys in October to give them time to mature. Of course, back then, we ate them with turkey sandwiches or slabs of cheese. Pickles and chutneys go just as well with a cold nut roast. You can make chutneys out of many different fruits and vegetables. I used what was lying around the kitchen. Apples are plentiful and cheap at this time of the year. I only buy the local varieties. We like everything spicy in our house but you can leave out the chilli if you want. Place all of the ingredients in a stainless steel or enamel pan. A wide, shallow pan works best. Bring to the boil. Turn down slightly and keep on a gentle boil for about 50 minutes until the liquid has evaporated and the chutney has thickened. Make sure it does not start to burn or stick during the last 10 minutes. It is ready if you push it back with a spoon and it does not run back into the empty space. To sterilise jars, wash in hot soapy water, and place on a baking tray in a hot oven for about 5 minutes, lids included. Fill jars while the chutney is still hot and seal. Leave for about 6 weeks. 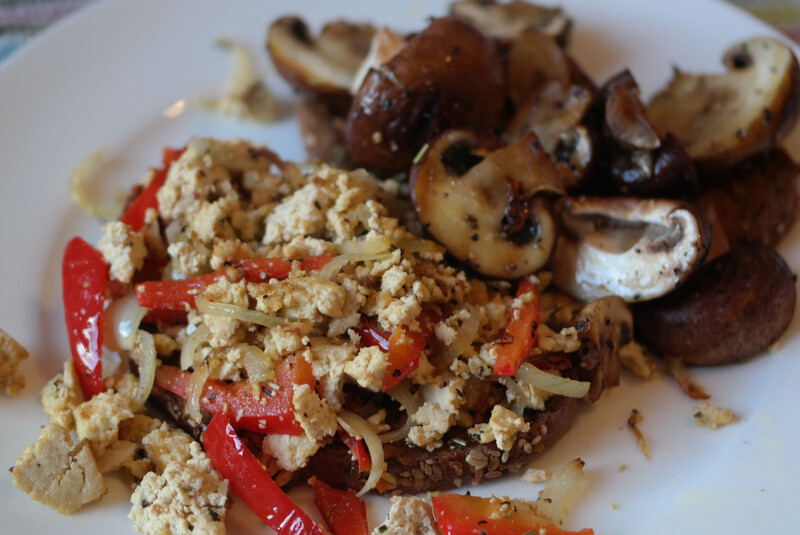 The autumn feeling is coming in Berlin and this calls for more hearty food. The last few weeks have been tough as we get into the new school year and the inevitable tiredness also means we look towards comforting food. 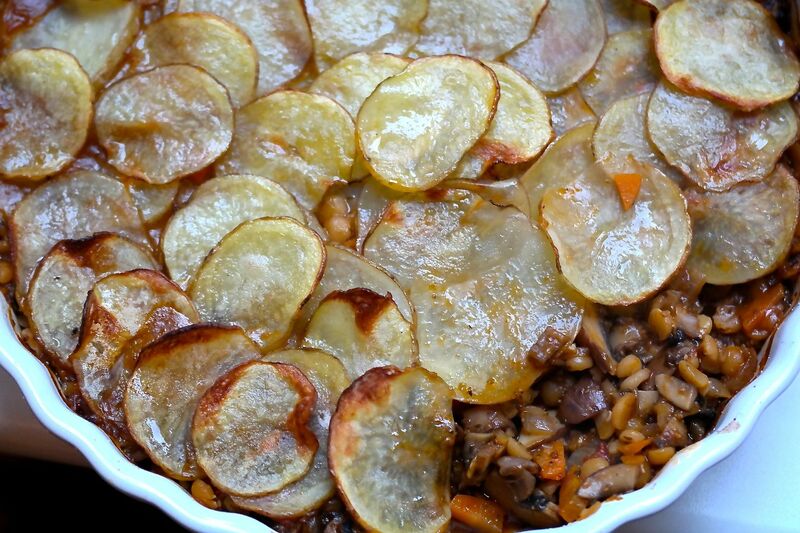 Lancashire Hot Pot is a traditional English dish made with lamb but it is the crispy sliced potato topping that I really associate with the dish from my childhood. Here the filling is made of chana dhal which retains a little bite and is made rich and succulent with mushrooms, wine, tomatoes and lots of herbs. It can be a meal in itself or served with piles of green veg like cabbage, broccoli and kale. I also made a thick gravy to serve it with. Put the lentils in a saucepan and cover with water. Bring to the boil and simmer until starting to soften but still having a firm bite. This will take about 30-40 minutes. Meanwhile, sautee the onion, garlic, carrots and mushrooms in 1 tablespoon of olive oil for about 5 minutes to soften. Add the drained, just cooked, lentils and all of the rest of the ingredients, except the remaining oil, and the potatoes. Bring to the boil and simmer for about 30 minutes until the lentils are properly cooked but not mushy. If you prefer, you could cook them softer. Season to taste and spoon the lentil mixture into the bottom of a wide shallow dish. By using a wide dish, you get a larger surface area to layer your potatoes and there is a better chance they will crisp up. Toss the potato slices in the remaining olive oil. Then layer them carefully over the top of the lentil mixture, overlapping the slightly. You can chose to have one or two layers deepening on how filling you want it to be. Season the potatoes. Place the dish into a medium oven for about 20-30 minutes until the potatoes are cooked and brown and crispy on top. Having developed a recent interest in the macrobiotic diet and its emphasis on whole grains, I am a recent convert to spelt. They call it dinkel in Germany and I think that is a much nicer name, making it sound more whimsical. I actually prefer the spelt raw and soaked for about 24 hours. I add it to stir fries and salads but I know that some people find it irritates their digestive system, so I have cooked it here. I made this really spicy with some great locally grown chillies I bought in a big bunch on the market in Berlin yesterday but you can leave it out all together if you prefer. This really is a meal in itself and it is delicious. It is chewy and crunchy and sweet and very savoury, all at the same time and, of course, incredibly nutritious. I served it on a bed of baby spinach leaves and we ate it with the soba noodle salad but we are greedy. 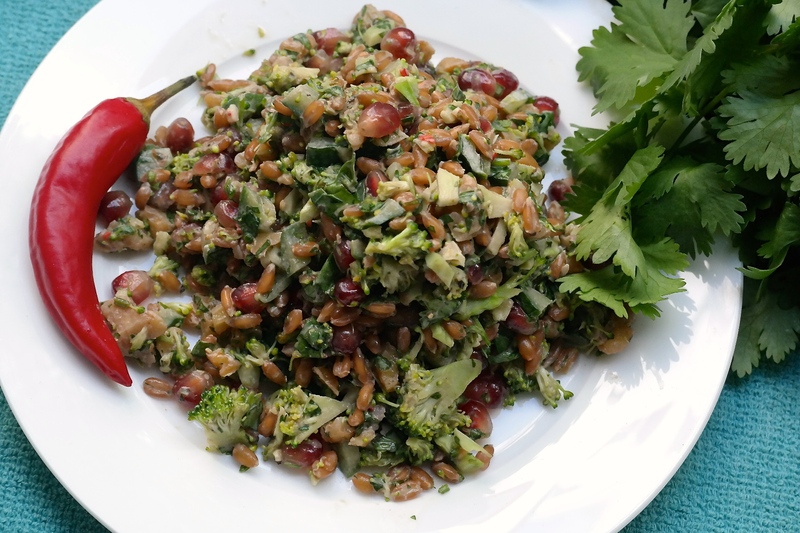 Combine all of the fresh ingredients with the spelt in a large bowl. 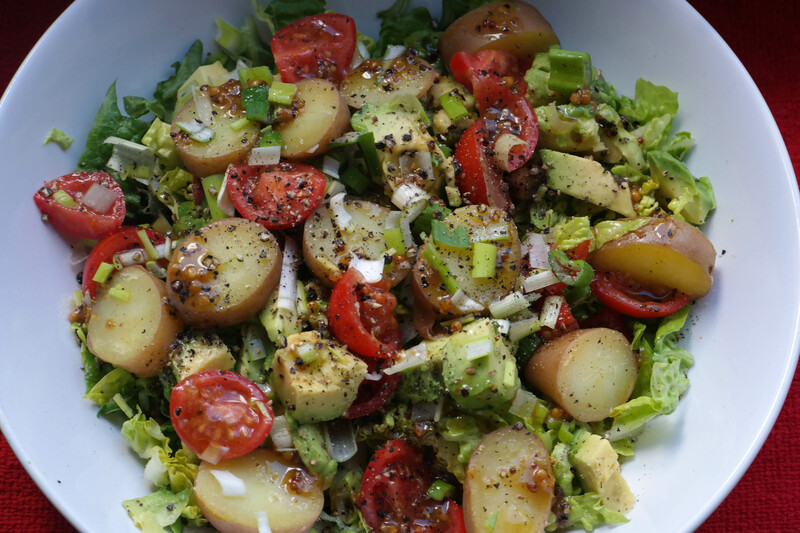 Combine the oil, vinegar, lemon juice, tahina, mustard, garlic and chilli to make a dressing. Pour dressing onto the salad. Season to taste. The summer has returned briefly in Berlin and it is making me crave for light, tasty dishes, especially salads. This could be made with baby spinach or shredded raw broccoli or you could add carrot and courgettes. I like to use the baby cucumbers as they are the only ones I really like but I still take out any seeds so it is not watery. Although it is not to everyones` taste, I think the seaweed is essential for that real Japanese flavour and it is very healthy. You can buy bags of dehydrated wakame in Asian supermarkets. You only need a tablespoonful of dried seaweed to make a large handful when it is rehydrated. To make a full meal, grilled or fried tofu marinated in teriyaki sauce would work really well. Cook the soba noodles briefly for about 3-4 minutes so they still have a bite. Refresh in cold water. Mix all of the raw vegetables and noodles in a large bowl. Make up the dressing with the remaining ingredients. Pour the dressing onto the salad and mix well. Sprinkle on the sesame seeds to finish.